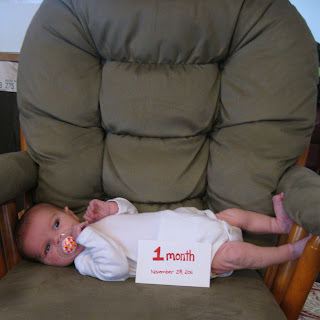 Today is Joanna's One Month Birthday! I wanted to list all of the amazing things that she's done this month but it's honestly too long for this blog. One month ago she didn't know how to do anything but kick her legs and punch my lungs, and those were involuntary. I hope. Joanna's grip is getting stronger each day! Her long, beautiful fingers are like boa constrictors as they wrap around jewelry, shirts, and whatever else gets in her grasp. She can hold her head up for a few seconds before it crashes into our faces. She can sort of roll over. She's accidentally done it twice now, but I think it's because her kicking gave her momentum.